Pinecrest Movers – Moving can create a lot of stress. 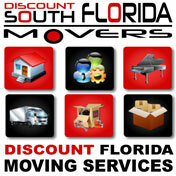 At Discount South Florida Movers are goal is to remove that stress from your move. Our team of experts have been fulfilling the moving needs of Miami for over 15 years. We have experience throughout Florida and have the lowest rates around. Our supervisors are on site at every move to guarantee your satisfaction. No matter what your home or office moving needs, are we can help. We can accommodate any schedule and will do nights and weekends at no additional cost. If you need help securely packing your belongings our experts will handle it. We can move you any distance as well, from a short distance move to across the country. Pinecrest is village of 18,000 located in the middle of Miami-Dade County. After being devastated by hurricane Andrew in 1992, the village rebounded and has consistently had some of the most expensive real estate in the country. They have also since incorporated, doing so in 1996 with Evelyn Greer serving as their first mayor. True to its name, the city is home to five public parks that range in size from three to ten acres. Evelyn Greer Park, the largest of the parks, boasts an athletic field, Wi-Fi hotspots, a recreation center, and other amenities. The local newspaper of the village is the Tribune which is printed on a biweekly basis. Discount South Florida and Pinecrest movers provide low rates on residential, commercial, piano and long distance moving.